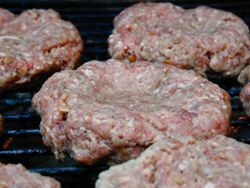 Cooks Illustrated suggests making a dent in the center of the patty to avoid those puffy grilled burgers that are more like a meatball than a patty. In addition to reduced poofing, the dent makes for an evenly cooked burger. No more giant charcoal briquette with a raw, bloody center! Yay! If you’re feeling sassy, chop up a few jalapeños and add them when you season the meat. We prefer crisp sweet onions, but you might grill the other half of the onion (in thick slices to prevent them from falling through the rack) as a nice condiment alternative. Put them on the grill right when you start the burgers, or they won’t finish in time. Crumble hamburger. Sprinkle all ingredients over. Using your fingers, lightly combine seasonings with burger. Don’t overwork the meat or it will get tough. Divide seasoned hamburger into 6 equal balls. Flatten each ball into a thick patty. Using your three middle fingers, press a large, shallow dent into the center of each patty. 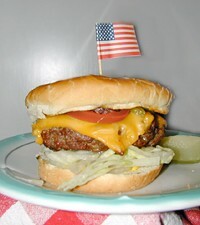 The indentation in the center of the burger helps fight the battle of the burger bulge. (See picture above for detail). Grill burgers over medium-hot coals for about 3 minutes, or until meat looks nice and browned and shiny (instead of just sweaty), and there are nice black grill marks. Flip burgers, layer with cheese, and cook an additional 3 – 5 minutes, depending on how well you like your bovine charred. Meanwhile, toast buns on the sides of the grill just until grill marks appear. Serve finished burgers open-faced on toasted buns & let guests dress their own. Slap some cheese on after you grill one side. 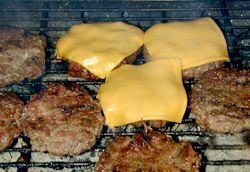 The cheese will melt while the other half grills, preventing the overcooking that occurs if you wait until after the burger’s done. This entry was posted on Thursday, September 6th, 2007 at 7:53 am	and is filed under Carnivore, Main Dishes, Master Recipe Index, Party Food & Snacks, Speed Queen (30 min/less). You can follow any responses to this entry through the RSS 2.0 feed. You can leave a response, or trackback from your own site.